If you answered a “Translation service for non English speakers”, then you would be right. Writing the instructions on how to use it in English only makes it even more pointless. Look – a cartoon gallery. I wonder what sort of jokes made Nick Griffin do a LOL in 2001? One minute, I’ll just check Google..
Nope, not the best observational comedy, then. I always thought those “Love is..” cartoons were the shittest, but this “Hate is…” one takes the biscuit. If you can find a worse cartoon on the web, feel free to link to it in the comments. 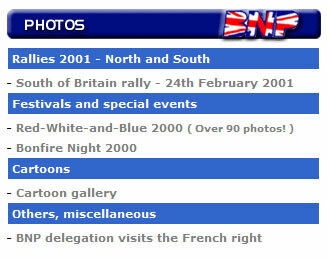 This entry was posted on March 28, 2010 at 7:40 pm	and is filed under BNP. You can follow any responses to this entry through the RSS 2.0 feed. You can leave a response, or trackback from your own site.